The Group had a good turnout at Liverton Post Office just before Christmas and raised £120 – this is to go to the Masanga Scout Group in Sierra Leone. And we also had a special visitor! And then in the first week of January we set up the pasty and hot drinks cafe in the woods for the Simms Hill rally. A busy day meant that we sold out of all our stock and made a profit of £400 for the Group. Many thanks to everyone who attended our annual Quiz Night at Ilsington Village Hall. 14 teams battled through the night and helped to raise just over £320 for our Group Funds. Our next events will be Carol Singing at Liverton Post Office on Saturday 17 December at 1030 where we will have mince pies and hot drinks available – raising money for Masanga Scout Group in Sierra Leone. 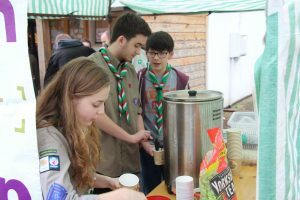 Cubs – Went on a very successful activity camp at Barton Hall in May, had a street party for the Queen’s 90th Birthday and joined the Beavers canoeing at Decoy. 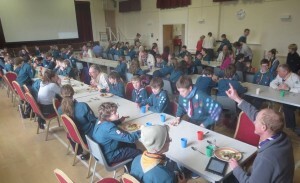 Scouts – Had a winter Camp for the older Scouts in February (in very wet weather! ), learnt about Scouting in Sierre Leone, plenty of cooking and campfires, March March (overnight hike and camp on Dartmoor), canoeing at Ugbrooke Lake and raft building. In addition at the annual Hurdlestone Challenge they had the best ever results recorded with teams in 2nd, 3rd and 6th out of 74 teams. A very successful survival camp was held in July with all of the Scouts building their shelters from natural materials and sleeping in them overnight. Explorers – Many outdoor activities including Clip’n’Climb, iBounce, shooting and camp cooking. The Dartmoor Beast Explorer Unit has now joined forces with Bovey Gateway Explorers and is now being run as a District Unit. We wish them well! 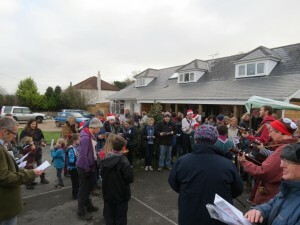 Just before Xmas the Group held it’s annual Carol Singing at Liverton Post Office. Our chosen charity this year was the RNLI, which was very prophetic based on the wind and rain we experienced that morning! 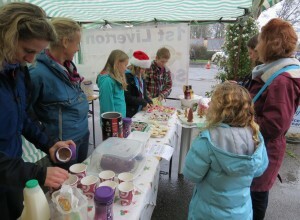 The hot drinks and cakes were very popular on the cold morning. With support from the RORA band and our own Group we raised £243. 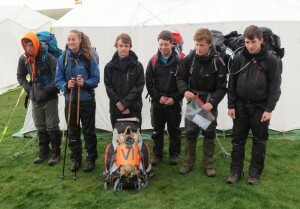 Congratulations to the Explorer Scouts who all completed the Ten Tors Challenge on Dartmoor in May. 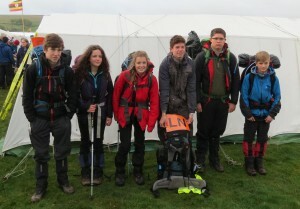 Matt, Ollie S, Ollie, O, Harvey, Harry, Henry, Ted, Ellie, Alice, Emily & Becky – along with another 50 Explorer Scouts in the Teignbridge District – all successfully completed the 2-day 35-mile expedition (whilst Becky completed the 45-mile) – carrying all their camping, cooking and survival equipment on their self-contained routes. Teignbridge District has been training the Explorers every other weekend since January in all areas of navigation, first aid, camping and fitness. 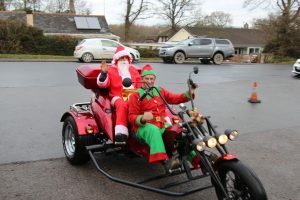 The traditional Carol Singing at Liverton Post Office just before Christmas was very well attended including a visit from Santa on his motor-trike! 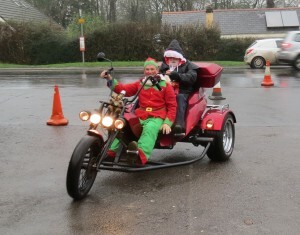 A combination of hot chocolate, teas & coffees plus plenty of mince pies and a raffle helped raise £240. 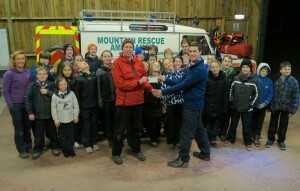 The nominated charity was Dartmoor Search and Rescue group based at Ashburton and the cheque was handed over on a recent visit by the Scouts. Recently the Group held a Quiz Night at Ilsington Village Hall and once again we had a room full of brains and brawn thanks to the challenging questions provided by Mark. We had 17 tables across the room, with both old and young represented. Thanks to Penny and Katherine, the bar was very popular and much health and heartiness was provided. Along with a raffle, with prizes donated by local businesses, the evening raised just under £500. Many thaks to everyone who supported us. What a busy start to the new term!! At the beginning of the month we had 56 Beavers, Cubs, Scouts & Explorers camping at Caddihoe Scout site – a first in getting all the Group under canvas. Once again it was a great family event giving the opportunity for the whole Group to come together and have Fun and Adventure. 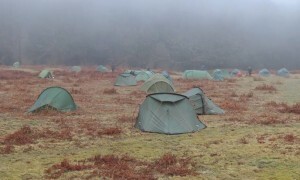 The Scouts and Explorers had set up the site on the Friday, with the Cubs and Beavers joining us on Saturday morning. We then had a packed day with activity bases ranging from Orienteering, Blind-trail, damper-bread cooking and paracord bracelet making. A traditional camp-fire at the end of Saturday, followed by wide-games in the dark for all but the Beavers, closed the day. Even so it was still a very early start when the Beavers emerged from their tents on Sunday morning (before 6am!). After the Beavers had returned home we then had a gentle day of outdoor games, with the camp closing after lunch. With a wonderful weekend of weather, and fantastic support from the adult leaders and helpers, it was a great success. 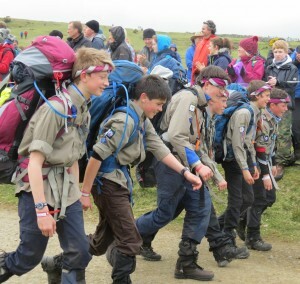 We then had 4 teams taking part in the District Mini 5-Tors event starting at Hound Tor. 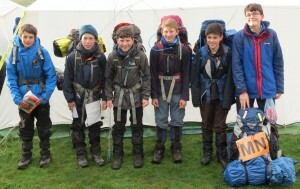 A team from the older Cubs completed the 16km hike in just over 7 hours. 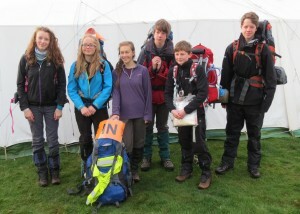 Two Scout teams walked 20km courses, and the Explorers the 24km hike. A challenging start to the day with the mist hanging over the moor for a few hours, but thankfully by lunchtime the sun appeared and made for a fine September day. Especially for the younger members, it was a great achievement for all taking part. This term we have had some great activities, we started off with First aid, where all got themselves wrapped up in bandages, thanks to Andy Mortimore and his team for coming in. We have also had the police visit, which was a great opportunity to lock the Beavers in the back of a riot van for an hour thanks to Sarah Harvey, Rob Condy-Young and their team, but I think next time they will arrive wearing their riot gear. Not to forget the Guide Dogs who came in and did a talk for nearly 30 min, everyone was gripped by what they had to say and there was some very thoughtful questions asked. We have focused on badge work this term, completing the Astronomers badge which involved making models and learning space facts. Pancake night was interesting!! We tried to make and cook small pancakes using tins and tea lights, luckily I got to taste a proper one made in a saucepan and thank you to the parents that helped to cook. As part or our balanced programme we have to look at Religion and Festivals so the first part of term was Chinese New Year with some great dragon mask making then we have just finished three weeks looking at Poverty in India, an Indian Festival and what charities help in India. We looked at what life is like in the slums of India and made a model of a shanty town followed by the Festival of Holi. We had a great curry night , with dancing and art work. The beginning of term saw us completing the fitness challenge and the Scouts taking on the bleep test with ever increasing gusto as well as discussing healthy living. We celebrated completion with a games evening and rounded up the half term with a session on South Africa, including food tasting that seemed to go down well. After half term we have learnt and refreshed our first aid. 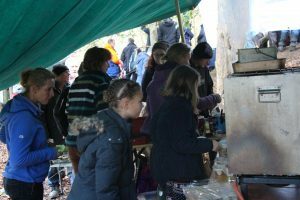 We tried cooking pancakes on open fires with limited success for many but some edible results. We had another educational session from Sally Yeo discussing the important topic of Internet Safety and awareness. We then tested our knowledge of the local community and rounded up with some wide games in the woods and a construction challenge. Outside our regular programme we also entered an enthusiastic team (Bethany, Jemma, Jack and Marli) to the district archery competition in January. March was our first year participating in the March March run by South Brent Scouts. We had 9 Scouts (Jasmine, Amelia, Matt, Jack, Will, Finn, Theo, Marli, George) who joined up with other scouts from local Troops to make groups of about 6 to hike across the Moor. 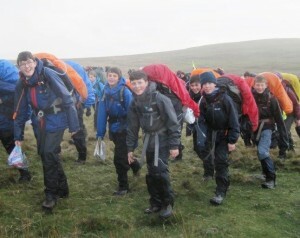 For many Scouts it was their first experience of wild camping on the edge of the moor beside a stream. We were blessed by the weather with clear blue skies although a cold night. The Explorers this term have been focusing on First Aid. We have taken the training up another level compared to that completed by the Scouts. The Explorers have been learning what to do with an unconscious child and baby as well as an adult (a big thank you to Dave Robinson from Torbay Hospital for his help teaching these skills once again), they have been learning how to recognise and what to do if they come across someone having an asthma attack, a heart attack, if a diabetic person has low blood sugar or if some one has signs of meningitis (thank you to Susie Patch (Group Secretary & GP) for helping run this session). We have broken the first aid up throughout the term with a variety of other activities including an egg drop challenge, a visit from our tame Police traffic officer (thank you Sarah Harvey), a fencing evening (I think some of them had been watching a lot of The Musketeers as they picked up the skills pretty quickly! ), a communication skills evening, pancake making (or at least attempted pancake making – I think some basic cookery skills may be called for next term, are there any volunteers who may like to come and help teach them?!? ), and walking the Templer Way from Hay Tor to Newton Abbot. We have awarded our first Explorer activity badge to Dan – who received his Performing Arts badge for his part in Aladdin at South Dartmoor. We have also awarded 4 Young Leader badges to Explorers helping in other sections within the Group, they are now undertaking further training to build on their leadership skills and hopefully achieve their Young Leader Belts. This summer 3 of our Explorers and 1 leader are joining the County Explorer Expedition to Iceland. They are off to take part in an international jamboree. 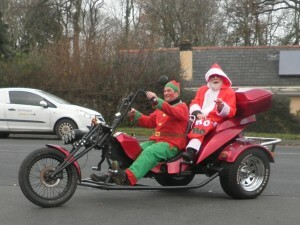 They are currently busy fundraising the £1000 they each need to raise to attend. Please look out for their fundraising events and support them if you can, it is a great opportunity for each of them to really get the most out of what Scouting has to offer.